This feature is currently in preview and could change as it is released or updated. Increase the audience reach of your Skype Meeting Broadcast by using real-time transcription and translation. This feature is now available as a public preview. Ten spoken languages are available: English, Spanish, French, German, Chinese (Mandarin), Italian, Portuguese (Brazilian), Arabic, Russian, and Japanese. Translation is available in more than 60 languages. 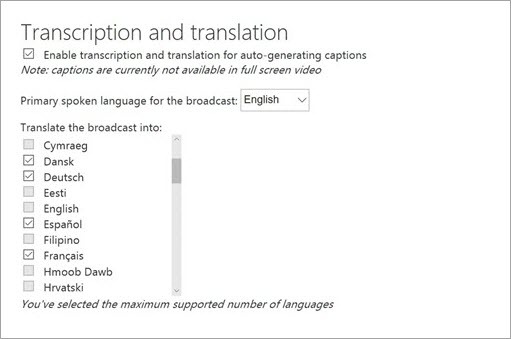 Learn more about the languages that Microsoft Translator supports. IT admins can turn on preview features from the Skype for Business admin center or by using PowerShell. From the Skype for Business admin center, select online meetings > broadcast meetings, and then select Enable Skype Meeting Broadcast Preview features for my organization. Broadcast organizers can enable broadcasts with real-time transcription and translation when a meeting is created. In the Transcription and translation section, select Enable transcription and translation for auto-generating captions. Organizers can select up to six languages for transcription and translation. Attendees will be able to select the language they want when they watch the broadcast.